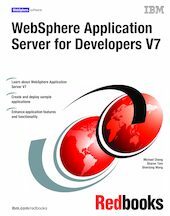 This IBM® Redbooks® publication can help you install, tailor, and configure WebSphere® Application Server for Developers V7 on the Microsoft® Windows® platform. WebSphere Application Server for Developers is a no-charge version of WebSphere Application Server for use in a development environment only. It allows application developers to develop and unit test against the same run time as the production version of WebSphere Application Server. Download and install WebSphere Application Server for Developers V7. Use the command-line tools, web-based administrative console, and scripting tools. Deploy a web application with Java™ Database Connectivity (JDBC) to the application server with the first version of a sample application. Configure the sample application with Enterprise JavaBeans 3 (EJB3) and Java Persistence API (JPA). Add Java Message Service (JMS) and message-driven beans (MDBs) to the sample application and configure the built-in system integration bus (SIBus) messaging infrastructure. Add Representational State Transfer (REStful) web service to the sample application. Incorporate WebSphere-specific application bindings files with the application. Enable debugging and produce and analyze JVM outputs. Learn how to use Eclipse to view and debug the sample applications.